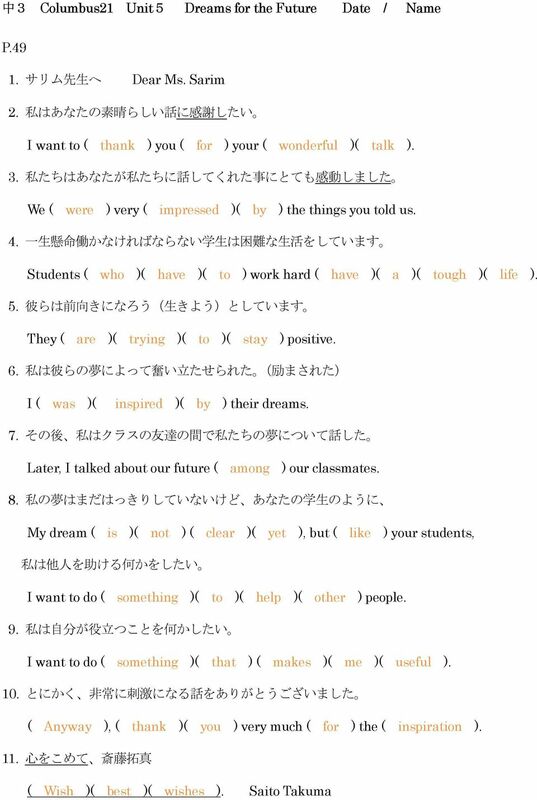 Download "中 3 Columbus21 Unit5 Dreams for the Future Date / Name P.47 1. Aya: ええ それがあなたを 幸 せにする 仕 事 です Yes. That s the job ( that )( will )( make )( you )( happ"
1 中 3 Columbus21 Unit5 Dreams for the Future Date / Name P Tina: サリムさんの 話 はとても 興 味 深 いものだったね Ms. Sarim s ( talk ) was very interesting, ( wasn t )( it )? 2. Aya: ええ 面 白 かった カンボジアの 学 生 がそんなにつらい 時 があったなんて 知 らなかった Yes, it was. I didn t know Cambodian students ( had )( such )( a ) hard time. 3. Tina: 私 も 知 らなかった ( Me ), ( neither ). 4. Tina: 先 生 が 私 たちに 見 せてくれた 写 真 は 本 当 に 衝 撃 的 だった The photograph ( that ) she showed us ( had )( a )( real )( impact ). 5. Aya: それらは 確 かにそうだった They ( sure )( did ). 6. 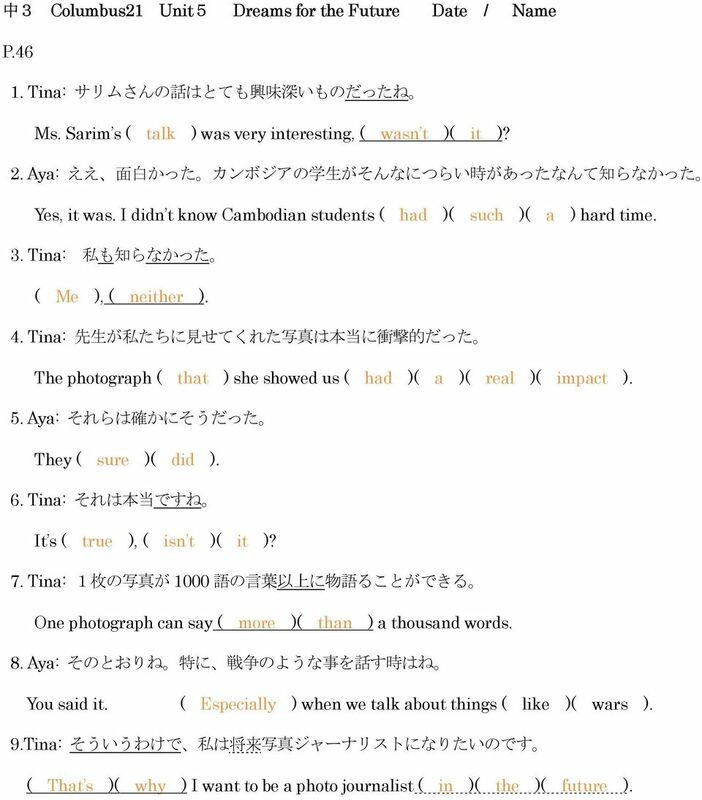 Tina: それは 本 当 ですね It s ( true ), ( isn t )( it )? 7. Tina: 1 枚 の 写 真 が 1000 語 の 言 葉 以 上 に 物 語 ることができる One photograph can say ( more )( than ) a thousand words. 8. Aya: そのとおりね 特 に 戦 争 のような 事 を 話 す 時 はね You said it. ( Especially ) when we talk about things ( like )( wars ). 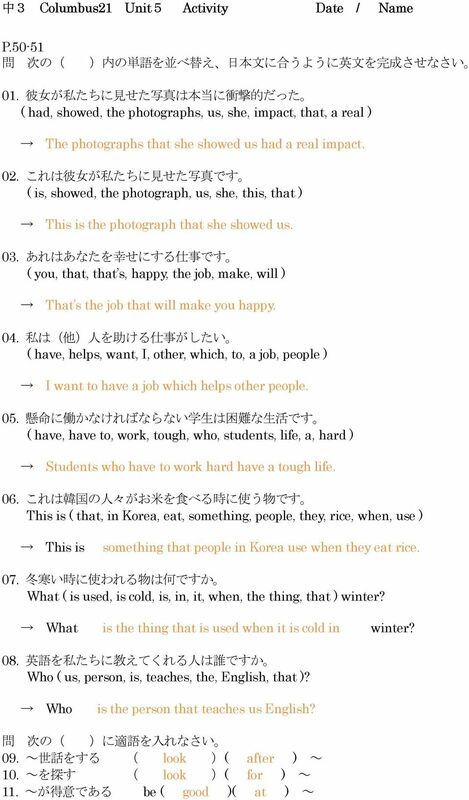 9.Tina: そういうわけで 私 は 将 来 写 真 ジャーナリストになりたいのです ( That s )( why ) I want to be a photo journalist ( in )( the )( future ). 2 中 3 Columbus21 Unit5 Dreams for the Future Date / Name P Aya: ええ それがあなたを 幸 せにする 仕 事 です Yes. That s the job ( that )( will )( make )( you )( happy ). 2. Aya: それが 一 番 です! でも 私 について 言 えば 私 には 新 しい 夢 があります You ll be ( the )( best )! But ( as )( for )( me ), I have a new dream. 3. Tina: それは 何 ですか? ( What )( is )( it )? 4. Aya: ええ 私 は 去 年 沖 縄 に 行 きましたね Well, I went to Okinawa last year, ( right )? 5. 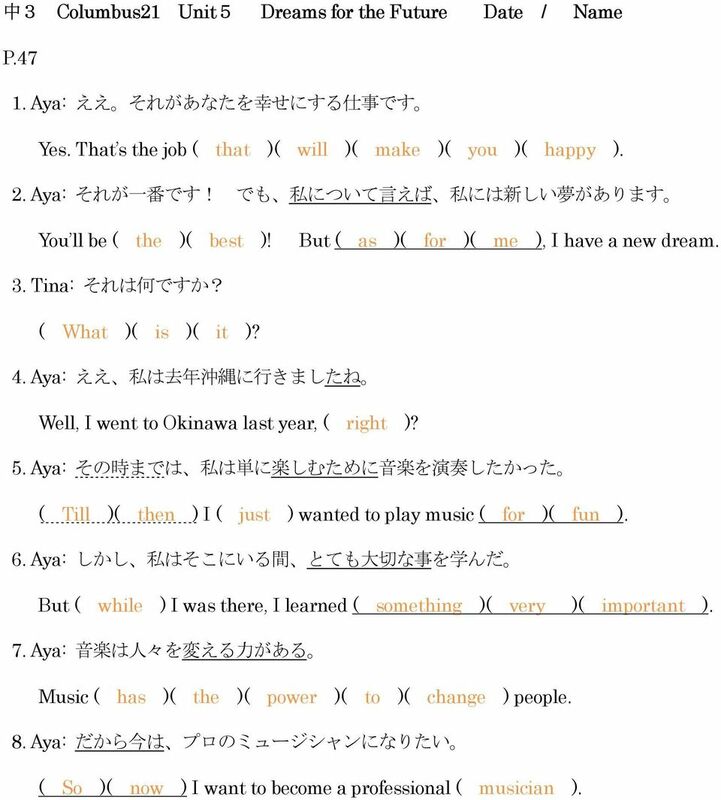 Aya: その 時 までは 私 は 単 に 楽 しむために 音 楽 を 演 奏 したかった ( Till )( then ) I ( just ) wanted to play music ( for )( fun ). 6. Aya: しかし 私 はそこにいる 間 とても 大 切 な 事 を 学 んだ But ( while ) I was there, I learned ( something )( very )( important ). 7. Aya: 音 楽 は 人 々を 変 える 力 がある Music ( has )( the )( power )( to )( change ) people. 8. Aya: だから 今 は プロのミュージシャンになりたい ( So )( now ) I want to become a professional ( musician ). 3 中 3 Columbus21 Unit5 Dreams for the Future Date / Name P Tina: 拓 あなたはどうなの? ( How )( about ) you, Taku? 2. Tina: あなたは 将 来 何 になりたいですか? ( What ) do you ( want )( to )( do ) ( in )( the )( future )? 3. Taku: 私 はまだ 決 まっていません I ( haven t )( decided )( yet ). 4. Taku: でも 私 は 一 つだけ 確 かな 事 がある But I know ( one )( thing )( for )( sure ). 5. Tina: それは 何? ( What s )( that )? 6. Taku: 私 は 他 人 を 助 ける 仕 事 がしたい I want to have a job ( which )( helps )( other )( people ). 7. Tina: ちょうどカンボジアの 学 生 のようにね Oh, ( just )( like ) the Cambodian students. 8. Taku: はい その 通 りです Yes, ( that s )( right ). 9. Tina: えらい! あなたは 医 者 になりたいのですか? ( Good )( for )( you )! Do you want ( to )( be ) a ( doctor )? 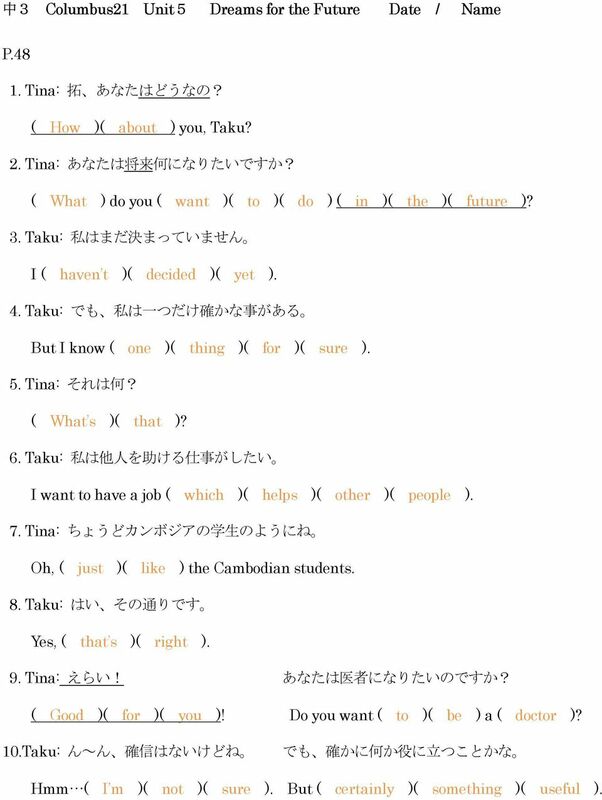 10.Taku: ん~ん 確 信 はないけどね でも 確 かに 何 か 役 に 立 つことかな Hmm ( I m )( not )( sure ). But ( certainly )( something )( useful ). 6 中 3 Columbus21 Unit5 Skit Time Date / Name P R: もしもし こちらはルミです アレックスはいますか? (アレックスと 話 してもいいですか) Hello. ( This )( is ) Rumi. ( May )( I )( speak )( to ) Alex, please? 02. M: ごめんなさい 彼 はいません 伝 言 を 伝 えておきますが ( 伝 言 を 残 しておきたいですか?) I m sorry. He s ( out ). ( Would )( you )( like )( to )( leave ) a ( message )? 03. R: はい お 願 いします 電 話 を 私 にくれるように 彼 に 話 しておいてくれますか? Yes, please. ( Could )( you )( tell )( him ) to ( call )( me )( back ), please? 04. R: もちろんです ( Sure ). Later: 05. A: こんにちは ルミ Hi, Rumi. 06. R: こんにちは アレックス 明 日 暇 ですか? Hi, Alex. ( Are )( you )( free )( tomorrow )? 07. A: はい Yes. 08. R: お 願 いがあるんだけど ( 一 つ 願 い 事 をあなたに 尋 ねてもいいですか) ( Can )( I )( ask )( you )( a )( favor )? 09. A: うん Sure. 10. R: 私 のレポートを 手 伝 ってくれますか? ( Can )( you )( help )( me )( with )( my )( report )? 11. A: もちろん 問 題 ないよ Sure. ( No )( problem ). 7 中 3 Columbus21 Unit5 Language Focus 2-1 Date / Name P 問 1 次 の( ) 内 の 語 を 並 べ 替 え 英 文 を 完 成 しなさい 01. ( in, T-shirt, boy, that, a red ) is Nick. That boy in a red T-shirt is Nick. 02, This is ( in, a book, English, written ). 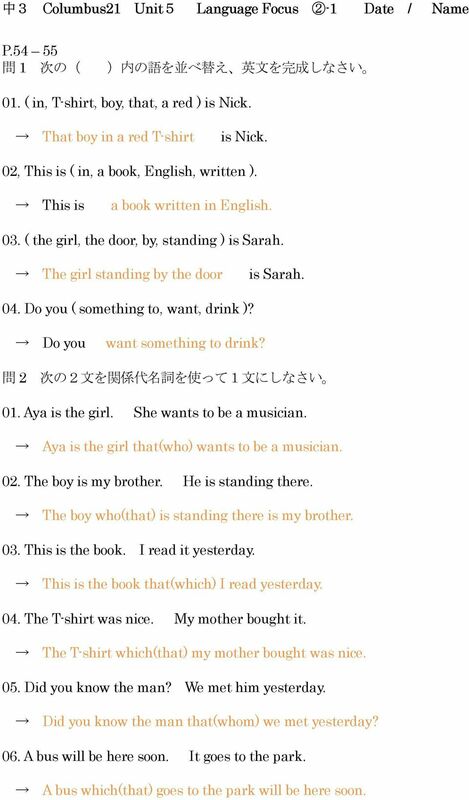 This is a book written in English. 03. ( the girl, the door, by, standing ) is Sarah. The girl standing by the door is Sarah. 04. Do you ( something to, want, drink )? Do you want something to drink? 問 2 次 の2 文 を 関 係 代 名 詞 を 使 って1 文 にしなさい 01. Aya is the girl. She wants to be a musician. Aya is the girl that(who) wants to be a musician. 02. The boy is my brother. He is standing there. The boy who(that) is standing there is my brother. 03. This is the book. I read it yesterday. This is the book that(which) I read yesterday. 04. The T-shirt was nice. My mother bought it. The T-shirt which(that) my mother bought was nice. 05. Did you know the man? We met him yesterday. Did you know the man that(whom) we met yesterday? 06. A bus will be here soon. It goes to the park. A bus which(that) goes to the park will be here soon. 8 中 3 Columbus21 Unit5 Language Focus 2-2 Date / Name P 問 3 次 の( )に 適 する 関 係 代 名 詞 を 入 れなさい 原 則 的 に that を 使 用 しないこと 01. A pencil is a thing ( which ) is used for writing. 02. A pencil is a thing ( which ) we use for writing. 03. Natsume Soseki is the person ( who ) wrote Botchan, 04. Botchan is a story ( which ) Natsume Soseki wrote. 05. Botchan is a story ( which ) was written by Natsume Soseki. 06. English is a language ( which ) is spoken all over the world. 07. Is there anything ( that ) I can do? 08 Who is the man ( that ) wants to be a musician? 問 4 問 3 の 中 で 関 係 代 名 詞 を 省 略 できるものはどれですか? 番 号 で 答 えなさい ( 2, 4, 7 ) 問 5 問 3 の 06 と 07 を 日 本 語 にしなさい 06. ( 英 語 は 世 界 中 で 話 されている 言 語 です ) 07. ( 私 にできることが 何 かありますか ) 問 6 上 下 の 文 が 同 じ 意 味 になるように( )に 適 語 を 入 れなさい 01. The boy who is sleeping on the bed is my brother. = The boy ( sleeping ) on the bed is my brother. 02. This book written by Soseki is the most popular in Japan. = This book ( which )( was )( written ) by Soseki is the most popular in Japan. 03. A baby crying on her back is my cousin. = A baby ( who )( is )( crying ) on her back is my cousin. 04. I was busy two days ago and I m busy now. = I ( have )( been ) busy ( for ) three days. 05. Getting up early is difficult for me. = ( It )( is ) difficult ( for ) me ( to ) get up early.